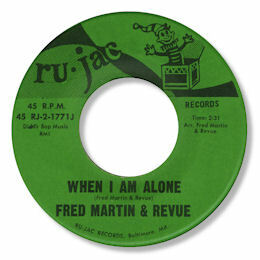 Along with Winfield Parker and Gene & Eddie, Fred Martin was one of the mainstays of the Baltimore based Ru-jac label. And like those other artists Fred made several excellent deep soul tracks. 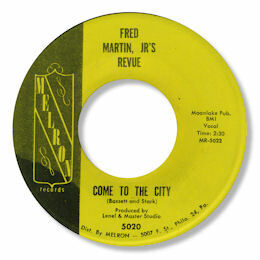 Fred's first 45 came out on the Philly label Mel-Ron but it is far too poppy to hit my taste buds. Far better was his sequence of singles for Ru-Jac, one or two of which may well have also been cut in Philly. It is pretty difficult to get them in any sort of date order due to the highly erratic numbering system used by the company but I would put the earliest two as Take Me Back Again and Love Don't Leave Me Now. The first of these is a splendid pleading ballad with a really anguished lead vocal, accompanied by a small band and a gently cooing female chorus. 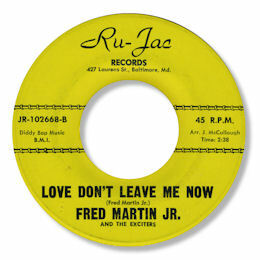 "Love Don't Leave Me Now" adds some horns to the mix but is stylistically very much in the same bag with an even more impassioned Martin performance. I would place the lovely When I Am Alone as the peak of his 45s. The downward sliding chord changes led by the horns and organ are great to hear and Fred is at his gritty best espcially towards the end of the number - you've got love that "Lord have mercy" and "I'm not ashamed to get down on my knees" he sings. I'm The One (Who Loves You), another fine ballad, appears to have been Fred's final vinyl release. Although not quite as strong as his previous 45 it was picked up by Chess for national distribution. But sadly like all his other releases it didn't generate any chart action. 1. I'm pretty sure the artist with the Matadors on the Cincinnati based Saxony label is another guy altogether. Can anybody confirm? 2. The Chess issue of "I'm The One" was in 1974. Some discographies put the Ru-Jac issue as 1968 - but I think that's unlikely. 3. 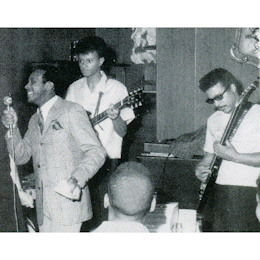 Fred Martin's Revue also appeared backing Willie Mason on Ru-Jac 32272 ("I Loved You Once" / Go On Back") and behind girl group the Joys on Salisbury, MD label Master 72370 ("Do You Believe I Love You" / I Loved You Once"). Both versions of "I Loved You Once" use the same backing track. Sadly all three of the sides are rather tuneless uptempo numbers despite what the dancers will tell you, the exception being the slower "Do You Believe I Love You" easily the pick of the bunch. 4. The Joys also get a credit for vocal accompaniment on Ru-Jac 9170.